I was born in the Georgian Soviet Socialist Republic, which by the time I was a teenager had become post-Soviet Georgia. After the Wall fell we had a bit more connection to the West, but it still wasn’t really possible to buy music in shops, so we mainly shared music between friends. However, there were some known shops that you could go to with a blank tape to record certain releases that made it into the country, like the latest Metallica LP. But during the preceding period—between the early ‘70s and ‘90s—most of the music that emerged was recorded and released in complete isolation. From 1964 on, there was just one record label in the Soviet Union, Melodiya, and it released everything from folk to movie soundtracks to rock music. It was run by the government, which was in charge of “state-approved fun.” Every piece of music in the GSSR needed to be run past them and approved in order to be released at all. Because of this strict approval system, it wasn’t easy to get ahold of music at that time if Melodiya wouldn’t put it out. Artists had to make their music sound “normal” and use lyrics that would get past government censorship. There wasn’t any censorship once the Wall fell, but there was no music industry in place either. This made underground and more abstract sounds more difficult to access, especially given that they were not particularly easy to locate or sell—even now. But in spite of this politically and artistically restrictive context, a few personalities made innovative music. Various nerds used synthesizers and a lot of artists experimented with weird electronic sounds, like Stanislav Kreichi, Alexei Borisov, Alexander Nemtin, Sven Grünberg and many more. For this piece I chose a few artists who help to depict the underground music produced during the Soviet and post-Soviet periods, as well as a couple from the region’s newer generation. These certainly aren’t the only artists who were active during the time, but they speak for a larger group of producers who were pushing the boundaries in experimental electronics. Sophia Gubaidulina was an important Russian musician. She experimented a lot with non-traditional methods of sound production. During the Soviet era, film soundtracks began to make experimental music more accessible, and many experimental musicians made soundtracks for very interesting directors. Gubaidulina in particular used instruments in unusual ways. She conducted musical experiments that became extremely important for the new generation of producers that arose after the Soviet era. “Vivente—Non Vivnete” is a beautifully dark and emotional track. Eduard Artemyev is known for scoring Andrei Tarkovskiy’s films. He was the first person to use electronic instruments within the Soviet regime who later became widely recognized. Artemyev had a platform for his music both inside and beyond the Soviet Union as a result of Tarkovskiy’s international success as a filmmaker. He was also one of electronic music’s early pioneers and the clearest example of the way film soundtracks and the development of experimental electronic music went hand in hand during the Soviet era. 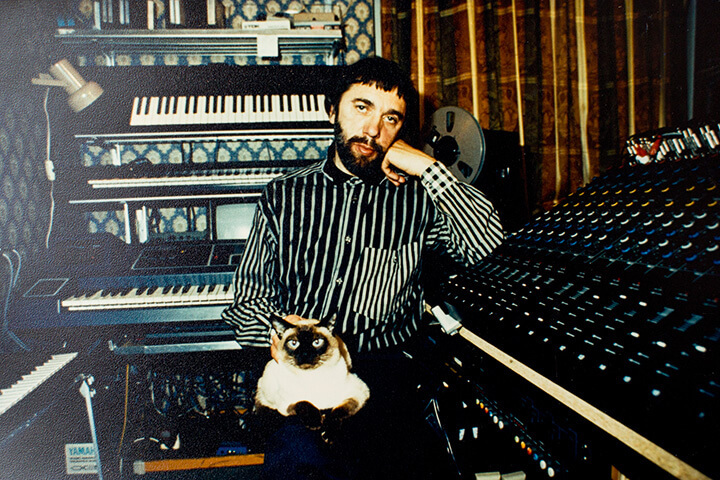 Oleg Buloshkin, like Gubaidulina and Artemiev, recorded pieces on the ANS synthesizer, a photoelectronic instrument created by the Russian engineer Evgeny Murzin. This synthesizer was invented as a result of technological developments around graphical sound recording used in cinematography. The new ANS synth made it possible to obtain a visual image of a sound wave and to synthesize sound from drawn sound spectrograms. Buloshkin’s piece “Sacrament” is a magnificent example of the technology in use. Valentina Goncherova was born in the Ukraine and moved to Estonia. She is still active. Goncherova has made work in many different areas such as free jazz, classical and chamber music. She also explores unique electro-acoustic sound techniques. NSRD is an acronym that translates to “Restoration Workshop of Unprecedented Feelings”. They were a musical, video art and performance group from Latvia that devised many interesting art performances, most notably Transwelt Telefon Konzert in 1988. NSRD wasn’t just one act, but a group of different musicians, visual artists, architects and photographers. Records such as these were only available on limited-edition magnetic tapes. This track is by Children’s Medicine, a group comprised of Irakli Charkviani and Dada Dadiani. They were two musicians who had a big influence on Georgian underground music. Listening now, it doesn’t necessarily sound weird or new, but in early post-Soviet times this sound was special. Their lyrics and music represented the soundtrack to the early ’90s post-Soviet era. This track involves an interesting combination of musicians. The original song is by the Russian cult band Kino and its singer Victor Tsoi. Kino only existed for a few years, and they had their real breakthrough in 1986. It was probably the most successful band in the Soviet Union because of the political nature of its texts and its timely concurrence with Perestroika, the Communist Party reformation movement. As a result, the group managed to reach a whole new generation, like Nikakoi, who did this cover and remix. He was a pioneer of Georgian electronic music and probably the most well-known experimental musician in Georgia from the early post-Soviet years. He released on German Labels like WMF and Laboratory Instinct. Because it’s now possible to make music in home studios without rare and expensive equipment, there are a lot of exciting new artists emerging in the eastern European scene. A few of these new artists have really captured my attention, like KP Transmission with her lo-fi industrial sound. Another amazing artist from the new generation is the Berlin-based Belarussian artist Chikiss (a.k.a. Galina Ozeran). Chikiss is a child of Soviet-era sci-fi, and her sound is tinted with the faded glory of suggested futures that never came to be. “Baby, Bye” is one of the most beautiful pieces of music that I have heard recently. Purchase the debut release from Irakli Kiziria’s record label, Intergalactic Research Institute For Sound, here.